← 180 "The Principal and the Pauper"
Homer is a Russian nesting doll that twists himself off and reveals each family members’s top halves. "I no longer want my MTV"
"Lisa's Sax" is the third episode of season 9 that originally aired on October 19, 1997. The episode was written by Al Jean and directed by Dominic Polcino. Fyvush Finkel guest starred. "When Lisa's saxophone is destroyed during a scuffle with Bart, the family recounts the story of how she got her instrument during the terrible heat wave of 1990." 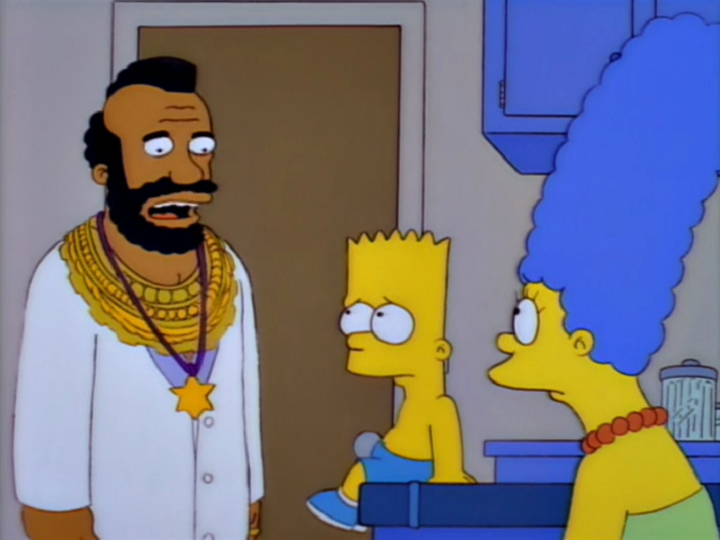 Julius Hibbert saying that Bart has a deep-seated psychological trauma. Homer and Marge play the piano and sing a song of their past days. Shortly after, we hear a clap from an unseen audience. While Homer and Bart watch a TV movie called The Krusty the Clown Story: Booze, Drugs, Guns, Lies, Blackmail and Laughter, their laughs get interrupted by the noise played on Lisa's saxophone from her bedroom. Homer asks her to stop to which Lisa responds that she has to have an hour of practice everyday. Bart enters Lisa's bedroom and tries to grab the saxophone from her. Because of the struggle with Bart, he inadvertently tosses Lisa's saxophone out the window. It lands in the middle of the street and is driven over by a car, a truck, jumped on by Nelson Muntz and hit by a man on a tricycle. In a period of mourning, Lisa reveals she cannot remember receiving her saxophone, so Homer recounts the instrument's origins. He says that in 1990, after Bart's very first day at school, he felt very depressed by a threat from Jimbo Jones, Groundskeeper Willie, and others. Then Homer and Marge, again, play the piano and sing how things went better after that. But Lisa comments that it has been a good story but complains that it has nothing to do with the origins of the saxophone. Then Marge tells the right story. It starts with Bart having experiences at school, and how his initial enthusiasm was crushed by an uncaring teacher, who offended him because of his failure to recite the alphabet, eventually turning Bart into the troublemaker he is today. He drew a violent sketch of his feelings and Marge became worried that something was truly wrong with him. It was during discussions of Bart's future that the school psychologist realized the young Lisa completed a complicated puzzle of the Taj Mahal and said her age was 3 years and three-eights. The psychologist told Homer and Marge that they needed to nurture her gifted spirit. They tried to send Lisa to a private school, to which 75% of its students immediately got promoted to Grade One. However, the tuition fee cost $6000. Realizing that it could have improved her intelligence, they had no choice but to try something else. A terrible heat wave hit Springfield and Homer felt hot while watching television. Marge said that they saved $200. Homer insisted on spending the money on an air conditioner as their stopgap solution (Snowball 1 fanning some ice) was getting cranky. Marge asked him to nurture her gifted abilities and thus, he was not helping Lisa one bit. Back at school, while his will-be-friend Milhouse drank soy milk, Bart made a funny gesture, making Milhouse spit the milk and finding him funny. He embarrassed Principal Skinner in front of the whole kindergarten, also making them all laugh. Meanwhile, Homer sacrificed his air conditioner to Lisa's first saxophone, which both valued $200 each. The music store manager asked Homer for an inscription on the saxophone, which Homer accepted. He said that the inscription will be "Never forget that you daddy loves---". But he accidentally dropped the sax prompting him to say "D'oh!". The whole thing he said including the "D'oh!" is included on the now crushed saxophone. Homer complains that the house has no air conditioner for many years, but decides to buy another saxophone for Lisa, again. This one says "May your new saxophone bring you many years of D'oh!". Following the purchase of the new saxophone, another heat wave hits Springfield. 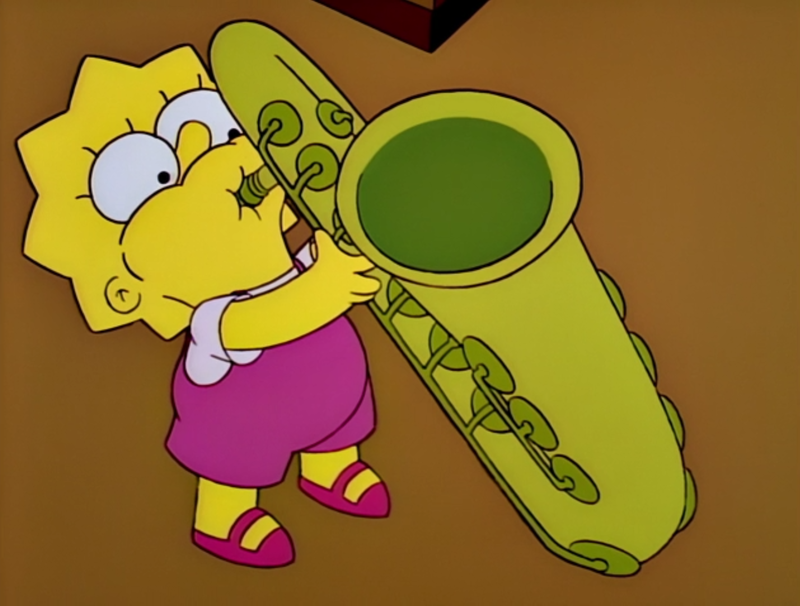 Wikisimpsons has a collection of images related to "Lisa's Sax". Modified on October 2, 2015, at 06:39.